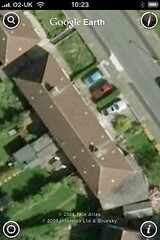 Google Earth for the iPhone is a stunning application – new photos of Birmingham too, as we hadn’t moved into our current house on the previous pics and there’s my car on the drive. This entry was written by Jon Bounds, posted on 27 October 2008 at 11:33 am, filed under my projects and tagged google earth, iphone. Bookmark the permalink. Follow any comments here with the RSS feed for this post. Post a comment or leave a trackback: Trackback URL.